In case you are not aware of, Wi-Fi tech has been quite stagnant for a number of years. We are currently on the Wi-Fi 5 (802.11ac) since 2014 – you’d notice this when you see the “ACxxx” on a router packaging. Well, the next generation of Wi-Fi named the Wi-Fi 6 (802.11ax) is about to hit us this year with faster speed, better performance, and more. NETGEAR is all ready and has now released a future-proof, new wireless router and you’ll want it at some point: NETGEAR AX8 8-stream AX6000 WiFi Router (RAX80). The RAX80 is an 8-stream Wi-Fi 6 router, providing 4 times more capacity than the current standards of Wi-Fi 5 routers. The wireless network is definitely getting more congested now than ever. Inside my house, there are more than 20 wireless devices all hungry for attention: wireless peripherals, smartphones, tablets, computers, security cameras, and smart home devices. Not to mention movie streaming and online competitive gaming being thrown into the mix. Bandwidth is getting scarce and signals get affected through the double storey house, plaster and concrete. This is about to change. The new Nighthawk AX8 router can handle all these with ease, thanks to the new Wi-Fi 6 standard which allows simultaneous data transfer between the router the devices. In layman terms, the new standard can handle more traffic better and faster. 8-Stream Wi-Fi Router – Relish your 8-stream Wi-Fi with up to 1.2 + 4.8Gbps* for blazing-fast wireless speeds. Highly Increased Network Capacity & Efficiency with AX Wi-Fi– Orthogonal Frequency-Division Multiple Access (OFDMA) enables efficient data transmission for more devices at the same time in upload and download directions to substantially improve network capacity and efficiency. Ease-of-Use Features. NETGEAR thoughtfully designs all its products to emphasise ease-of-use qualities. Nighthawk AX routers are no exception, with many features that make it easy to manage and protect your network, devices, and precious content. Voice Control — Use simple voice commands to control your NETGEAR Wi-Fi network as Nighthawk AX8 works with Amazon Alexa™ and the Google Assistant. 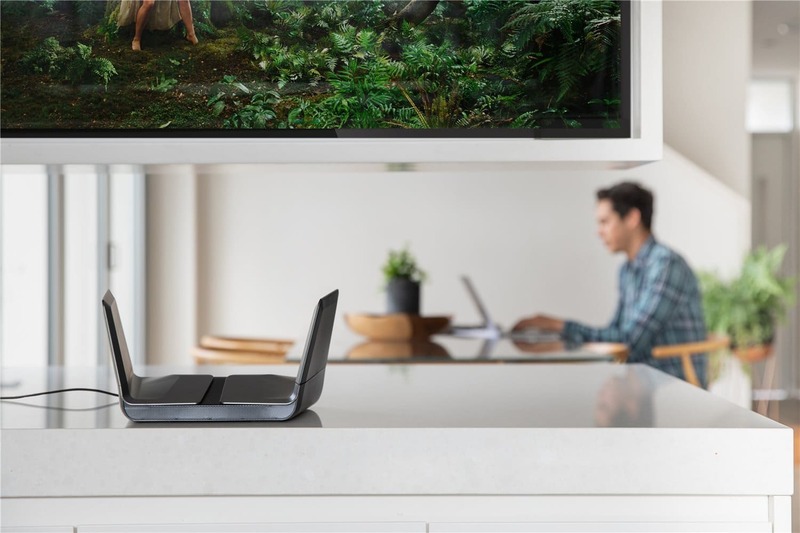 The NETGEAR Nighthawk AX8 8-Stream AX6000 Wi-Fi Router (RAX80) is available from authorised NETGEAR partners and other reseller channels, ecommerce sites, and major retailers, at an RRP of $599.99 (AU). The future is here, folks, whether you’re ready or not. Meanwhile, I’m still on the NETGEAR Nighthawk XR500 Gaming Router but definitely bracing myself for the future this year. Stay tuned for the reviews on some of the Wi-Fi 6 routers here at Craving Tech this year!